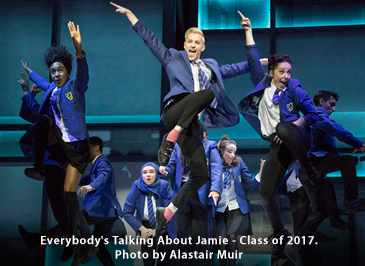 Everybody’s Talking About Jamie has released FREE PSHE & Drama educational packs to support studies in English, PHSE, SMSC, Health & Social Care, Performing Arts, Drama and Music for students Key Stage 3 through to A-level. Our teacher approved resources explore themes of identity, relationships, resilience and respecting difference with pre and post-show in-depth lesson plans, printable resources, the background to the show, interviews, designs, script extracts and more. This resource pack is aimed at teachers and students studying PSHE from Year 9 upwards. The themes cover core areas of study in the PSHE Government Guidance as well as the PSHE Association Programme of Study and activities are linked to the three main areas: Health and Wellbeing, Relationships, Living in the Wider World. Activities presented in this resource have also been designed to assist schools in building supportive school environments and as such, may also be used in peer support, or pastoral care settings taught through whole-school enrichment and SMSC initiatives. This resource pack is aimed at teachers and students of Drama, Theatre Studies, English (GCSE, AS & A level) and BTEC Level 3 in Performing Arts. Given the themes in the production, it will also be of interest to students and teachers of Citizenship/PHSE as well as covering themes taught through whole-school enrichment and SMSC initiatives. This pack is aimed to support students who are studying the production elements of a live performance for their Drama GCSE, AS or A-Level exam. The interviews with the artistic team give insights into the design and directing processes as well as illuminating the themes in the play as they see them. In the second part of the pack, there are pre and post-show activities to encourage discussion and debate. Download the Live Theatre Review PDF to compliment this pack and your visit to the show. Bookable through Nimax Group Sales.